As Killings Unfold On Live TV, Media Consider The Graphic Footage : The Two-Way Today's shooting of two journalists during a broadcast has reopened a conversation about how (or even if) sensitive material like the TV station's video — and the gunman's video — should be shared. It's all too raw: the grieving of survivors, the images of carnage, the way we learn of events and the way we consume them. Viewers of the morning show for WDBJ-TV in Roanoke, Va., actually watched the deadly shootings of reporter Alison Parker and videographer Adam Ward. And they watched it live, unexpectedly, without warning. So did the program's anchors, who were themselves shocked, initially uncomprehending, appalled. 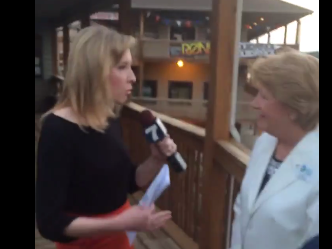 Others quickly grabbed that footage from WDBJ-TV and posted it online and on the air. CNN, for example, rebroadcast a portion of the station's video, including the shootings and a fleeting glimpse of the shooter. Anchors told viewers the network would only show it once an hour. MSNBC and Fox News do not appear to have aired the actual shots. By the middle of the day, CNN said it would hold off on showing the footage again. The decision to air or share such material has to be a conscious choice. Often it is not. So do we, as viewers, have to think hard about what we choose to consume. The Roanoke station where Parker and Ward worked has decided not to rebroadcast it. "We are choosing not to run the video of that right now because, frankly, we don't need to see it again," Jeffrey Marks, WDBJ's station manager, said on the air Wednesday morning. Marks' rending observations, and those of his colleagues processing the deaths in public view, admirably sought to present well-rounded pictures of the two journalists. The station and its staffers tweeted out tributes, even as they continued to report the story. But social media were also employed to try to immortalize the killings, apparently by the chief suspect, Vester Lee Flanagan, who once worked at WDBJ under the name Bryce Williams. On Facebook and Twitter, accounts with that name and image posted chilling video clips filmed from the point of view of the killer as he stalked his victims, the muzzle of the gun visible throughout in the center of the frame. And then the shots rang out and viewers could clearly see the results. After an online outcry, Facebook and Twitter pulled those accounts down. The status on a LinkedIn account bearing his professional name simply carried a smiley face. The two clips evoked something of Oliver Stone's Natural Born Killers. But they aren't fiction. Nor are they the archival reels of Jack Ruby shooting Lee Harvey Oswald on live television after the assassination of President Kennedy a half-century ago. This was a targeted killing on social media, a 21st century killing intended to be witnessed, as I did (unexpectedly, since Twitter's live-roll process prompts automatic play of any video embedded in a tweet). Digital technologies enable us all to document the stories of our lives. And reaching a massive audience has never been easier for anyone with an Internet connection — including, apparently, a killer.